Fecon Inc.’s Depth Control Rotor system (DCR) is now available on all six excavator Bull Hog models. 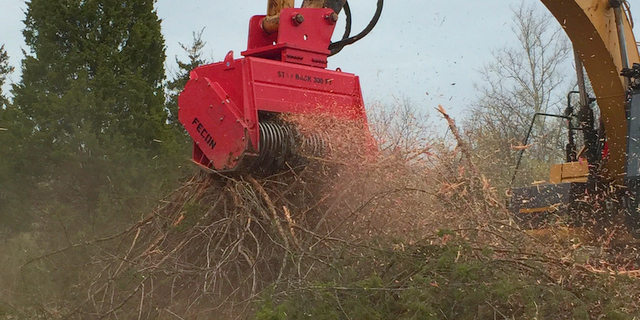 This brings a new level of performance and value to mulching, controlling the depth of bite and efficiently directing material flow so that energy is reserved for production. DCR cuts faster, delivering better fuel economy and more uniform particle size. The DCR system is an evolution that builds on Fecon’s reversible Samurai Knife Tool. Depth control rings of the DCR system work in harmony with the Samurai Knife to enable more cutting with less HP. The shape of the Samurai knife edge efficiently slices as it chips, providing greater forgiveness on rock than straight-edged tools or saw teeth. Depth control rings lend further impact protection to the tool body, and reduce shock loading to the mechanical or hydraulic drive line. For more info on Fecon, visit its website right over here. @CompactEquip Thanks for the tweet! !